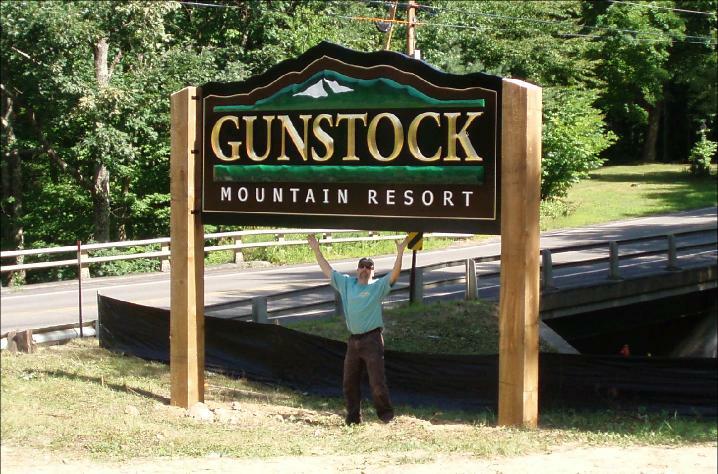 This is a repeat of a large sign we built a few years back for Gunstock ski area. It is a hybrid of sorts that started us down a path to a new method of fabricating large dimensional signs. This sign is 12' X 7' and only weights 150lb. It is built with all aluminum framing and composite metal faces which are bonded with a high tech chemical welding adhesive called, methacrylate. The finished sign panel is a torsion box that is extremely strong and light. Onto this we stud mount all the carved graphics. The end result looks pretty good don't you think.